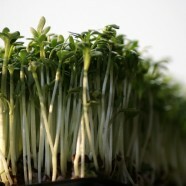 Most people could not imagine the enormous health benefits found in Broccoli sprouts. Learn about their special nutritional contributions and how easy they are to grow. Broccoli sprouts are also available in your local grocery stores. Let’s first look at the health risks these diet rich nutrients are being hailed for and why? The antioxidant powerhouses ‘sulforaphane, glucoraphanin, and glucosinolates’ are many times higher in broccoli sprouts compared to mature broccoli. In fact they posses 10-100 times more glucoraphanin than regular broccoli. Also corroborated by Johns Hopkins University, broccoli sprouts contain as high as 50 times the concentration of phytonutrients compared to the mature broccoli. How does sulforaphane help fight cancer? Sulforaphane is an especially potent compound that has shown to boost our body’s protective enzymes that can actually remove cancer causing chemicals according to Jed Fahey, ScD.Jun 19, 2012. The breakdown of the antioxidant organosulfur compounds (sulforaphane) is as follows: Sulforaphane (SFN) is a molecule within the isothiocyanate (ITC) group of organosulfur compounds. Sulforaphane is a phytochemical commonly found in cruciferous vegetables such as, Brussels sprouts, broccoli and a variety of cabbages. Harvested at just 4 to 5 days old, broccoli sprouts provide a 3 ounce serving of: 2 grams of protein, 5 grams of carbohydrate and 4 grams of fiber. How long do you soak broccoli sprouts? Sprouts are wonderful in salads, on a sandwich, or sprinkled on certain prepared foods and as a garnish. Also add them to your favorite vegetable or fruit juice recipes. Enrich your diet while supporting your quality of life and longevity by regularly eating sprouts.